​The sound of cicadas is one of the more distinguishable nature sounds of the Midwestern summer. Whether you love it or hate it, the call of the cicadas will be returning this summer in a different and likely louder way than in the past couple years in Indiana. Cicadas are interesting insects, living the vast majority of their lives underground as larvae for several years before emerging to the surface to shed their shells and become adults for around a month and reproduce before dying. In general, there are two types of cicadas: annual and periodical. 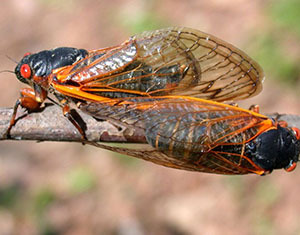 Annual cicadas are about two inches long and are greenish in color. They are found in vast numbers in the late summer and early autumn. Unlike their name suggests, they live as larvae for two to three years before emerging, but due to overlapping generations, they can be heard every year. They produce their loud, buzzing and ticking calls from their abdomen to attract mates. Brood XXIII of the 13-year periodic cicadas will emerge this June, and it is expected to be a big one. While loud, these insects are fairly harmless. They don’t pose a risk to humans as they don’t bite or sting. However, the egg laying process can be harmful to young trees with branches less than 3/4 of an inch thick. These trees can be covered with screens to allow sunlight to still reach the trees while keeping the cicadas out. Pesticides are typically avoided since the adult cicadas do not feed on the trees and will not ingest the chemicals.